You are here: Home / Wedding Ideas / How to Save Money on Your Wedding Budget (100+ ways, 2nd of 3 parts). 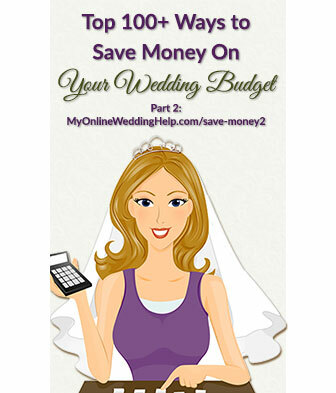 How to Save Money on Your Wedding Budget (100+ ways, 2nd of 3 parts). Here are 38 more ideas on how to save money on your wedding budget. Part 1 covered money management as well as venue and planner, caterer, and the toast. This next installment focuses on the beverages, cake and dessert, flowers, centerpieces, photos and video, beauty items, and band. 39. Serve beer and/or wine as the only alcohol-containing drinks. Mixed drinks are generally more expensive. 40. Limit the amount of time drinks are available. 41. Discuss having servers circulate with trays of designated, premixed drinks instead of having an open bar. The added labor will likely be more than offset by fewer drinks consumed by guests. And you get the boost of a more elegant presentation. 42. In addition to a small wedding cake for cutting, serve a second one with the same flavor and frosting. Bake this one in a large rectangular pan (refer to it as a “sheet” cake when ordering), making it cheaper and less labor intense than a tiered cake. 43. Have additional desserts, as well as a small wedding cake. The desserts will cost less than a larger wedding cake, plus most will appreciate having a choice. For even more savings, allow the deserts to do double duty as favors or centerpieces at the guest tables. 44. Choose buttercream frosting instead of fondant for the cake. 45. Plan on 75–80 percent of those in attendance eating dessert, instead of the entire guest count. 46. To avoid waste and cost, serve small portion sizes such as mini-pieces of cake, small cupcakes, little cookies, and individual candies. 47. For a small wedding, order a small but lavishly decorated wedding cake just large enough to feed your guests. There is no real need for a “regular size” cake when most of it will go to waste. You may also be pleasantly surprised at how fancy you can get for relatively little cost. 48. Add an upscale look to the cake or dessert displays, without a corresponding increase in cost, by ordering monograms or other decor personalized with your wedding logo. Each of these custom monogram cake toppers, for example, are about the same price as stock items at Michael’s or Hobby Lobby. Note: As with most links on MyOnlineWeddingHelp.com, some of the links in this post go to this site’s shop section or directly to another website. My Online Wedding Help will receive a small commission from the merchant if you click and buy a product. Top: This acrylic monogram cake topper is available in your choice of 17 colors and 5″, 6″, 7″, or 8″ across to fit a 5″-10″ across cake. The artisan, Jason, says, “Your love is my motivation”. Bottom: Yulia makes this wooden monogram cake topper in your choice of 5″ or 6″ wide in natural wood, gold, or silver. 49. If you simply cannot afford the type of upscale dessert display pieces you have in mind, consider hiring a baker or caterer that specializes in dessert buffets and provides displays along with the goodies. You may find you can afford it. 50. Compare prices when you buy or order flowers, and consider both online and local sources. Prices can vary widely. 51. Research reviews before choosing final flower vendors or suppliers. This can save costly “do overs” or disasters due to unreliable vendors. 52. Opt for filler flowers with many tiny to small blooms, such as baby’s breath, that take up a lot of space but cost relatively little. 53. Use greenery strategically to help keep the cost of flowers down. 54. Use ALL greenery and carry bouquets of ferns instead of flowers. 55. Consider both per-stem price and overall cost when you select flowers. Some large blooms, like football mums, can appear pricey but take up so much space end up being cheaper overall. 56. Because flowers tend to be cheaper when they are more abundant, consider natural blooming season in conjunction with general per-stem cost when selecting flowers. See the In-Season Flowers pinboard for ideas. 57. For the best price on bulk flowers, consider buying from a wholesaler or club store (the above-mentioned pinboard has links to several online options). 58. Shop local dollar and charity-resell stores for mix and match or small, lightweight vases. 59. Buy larger vases in bulk online; then, resell them after the wedding to another local bride or through eBay. Visit MyOnlineWeddingHelp.com/vases for options. 60. Be open-minded about the florist’s suggestions to stay within your flower budget. She knows the ins and outs of cost. 61. Look into using live plants for decorations instead of arrangements. 62. Limit the use of flowers by going with less-pricey alternatives for decor, such as candles. These two rustic candle centerpieces, for example, are currently $18 (plus starting at around $8 for three plain pillar candles) and $12 (plus around 50 cents for the three unscented tea lights), respectively. Compare these to most fresh flower centerpieces with similar impact and you will quickly see the difference in cost. Top: Jennifer wraps three stagger-stepped wine glasses with natural twine and accents them with lace to make this candle centerpiece set. You can vary the total height of your centerpiece by your choice of candles (not included). She used 6″ tall pillar candles in the photo. Bottom: Matt creates this set of tree wood tea light holders from 3″ diameter logs approximately 4″, 6″, and 8″ tall. 63. To help you decide if a professional photographer is right for you, perform a side-by-side comparison of DIY versus her photos. Often, couples find the added cost of a pro over shots by guests or designated amateur is worth the budget hit. 64. List your core photo requirements (e.g., which shots you would cherish most ten years from now) and get a basic package including those and little else. 65. Skip the special video effects, music, or other add-ons, and purchase the raw or minimally edited footage. 66. Look at both package prices and á la carte costs for photos and video, based on hourly rate and number of prints or copies. 67. Have only one photographer and one videographer cover your wedding. 68. When you consider costs, be sure you are comparing “apples with apples.” What appears to be at first more expensive can be a better value after looking at the details. 69. Consider hiring both the photographer and videographer from the same company. The cost could be less, and the logistics almost certainly simpler, than going with two different sources. 70. Consider buying digitals only and ordering prints as needed. 71. Research customer reviews instead of making expensive impulse buys. Inexpensive does not always mean ineffective, and vice versa. 72. Use multiple beauty brands to get the best value for your wedding-day look. 73. Buy only one or two products from your makeover and ask for samples of those you will not be using after your wedding day. 74. Make sure the nail-care bottles are fresh. Old polish chips more easily. 75. Look into having the same people perform at both the ceremony and reception. 76. Hire a small instead of large band. Part 3, the final 37 money saving tips, addresses the rehearsal dinner, rings, skin care, dress and accessories, save the dates, jewelry, the reception, and gifts.